If you follow me on social media (and watch my Insta stories) you know that I identify first as a boss lady and second as a dog mom. I have a one and a half year old Plott Hound named Butters who we adopted from the Brandywine Valley SPCA in May of 2016. She is our pride and joy. Because I work from home, we are able to spoil Butters a lot. She really does have a very cushy life here with us because she's almost always with someone who will snuggle her and give her lots of love and attention. In the time that we've become doggo parents, I've learned that HomeGoods really is the place to buy gourmet dog treats for cheap (not even kidding) and we have discovered some awesome products that we just cannot live without. I love the Kurgo tether for two reasons. It's thick and very sturdy and it's easy. It clicks right into the car seat buckle - no need for extra harnesses, specialty dog car seats, etc. We can pass it back and forth extremely easily to whoever has Butters and she has room to move around and get comfortable without being able to climb up into the front seats. GET IT HERE. I think this one is self explanatory but when you can get 900 poo bags for less than $15, it's worth talking about. 900! GET THEM HERE. Ok, I saw this on SharkTank and admittedly, I was really skeptical. I am also really horrified by the pills and chews that are marketed for flea and tick repellants. I'm equally terrified by the chemicals that go on as ointments. I've become very conscious of what I put on my own skin, why wouldn't I be the same for my dog? I love her! So, we use this. And it's AMAZING. I love the lemongrass scent the most but that is just personal preference. They have a huge array of products for pets, humans and your yard. All are completely free of toxic chemicals and they pledge to never use artificial colors or fragrances, preservatives, pyrethrins or synthetic pesticides. GET IT HERE. Butters loves her Kong Cozies. She's a rough player and likes to tear toys apart so we keep these for the car, sleepy time and thunderstorms but she loves them. She will drag them around with her and use them as pillows or just hold them for comfort. It's freaking adorable. Plus, they're cheaper if you buy a bunch of them online than they are as singles in pet stores. GET THEM HERE. When Butters was teething she used to eat our baseboards... just gnawing away at the wood. I still haven't gotten around to fixing them yet. 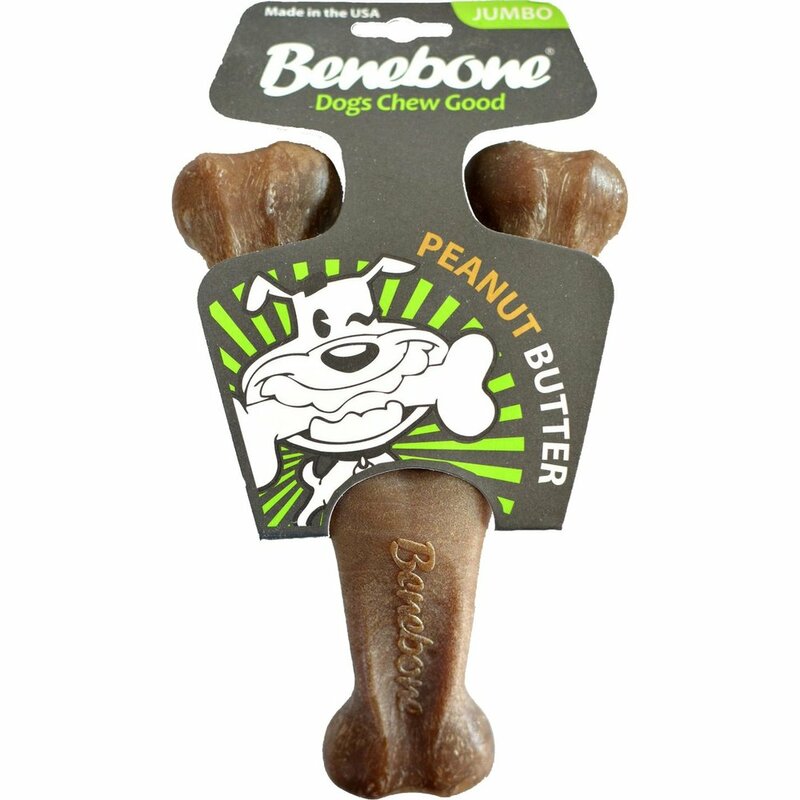 We discovered Benebones during that time and she loves them. They're a small business, they only use natural flavoring, they give back to animal charities and the price point is great. Butters enjoys all of their flavors and shapes but we think the bacon wishbone is her favorite. GET THEM HERE. The last time I was at Ikea I bought 10 of these and we just have them shoved into a closet for when we need them. I'm not kidding you, they're great. The size is big enough to cover our couch cushions and they are machine washable. Butters really prefers human furniture to her dog bed (honestly, I think she's laid in her dog bed once) and I get tired of scrubbing treat residue and dog hair off of our couches so I cover them with these and just toss them in the wash a few times a week. At $1.99, I don't care what happens to them either. You can find them at Ikea. We own about 4 of these and they're laying all over our yard. They get left outside 24/7 and they're so sturdy. I can't throw... admittedly... but the tail on this makes it easy for me to whip the ball the whole way across the yard. Bonus: Butters loves the tug feature of the handle. GET ONE (or many) HERE. We recommend the medium size. Of the things I love most in life, my dog and Lilly Pulitzer are high on the list. I saw this on Instagram and ordered it within minutes. I LOVE IT. Go get yourself one at Sew Southern Designs.